The fishing season is open 12 months of the year in Gold Beach on the Rogue River and in the Ocean just outside the Port of Gold Beach. The runs of Salmon and Steelhead vary as to their catchability and presence in the river. We have Salmon runs for Spring Chinook – Summer or Fall Kings and Coho or Silver Salmon about 8 months of the year. The other months are mostly Steelhead fishing. We also have varied methods of catching Salmon and Steelhead. Both Spring Chinook and Winter Steelhead are caught on the Rogue River by anchoring on corners in migration paths with a top on the boat and a heater if it gets cool. Many days on the Rogue River for Spring Chinook or Winter Steelhead exceed 60 to 65 degrees, we have a very mild climate here. 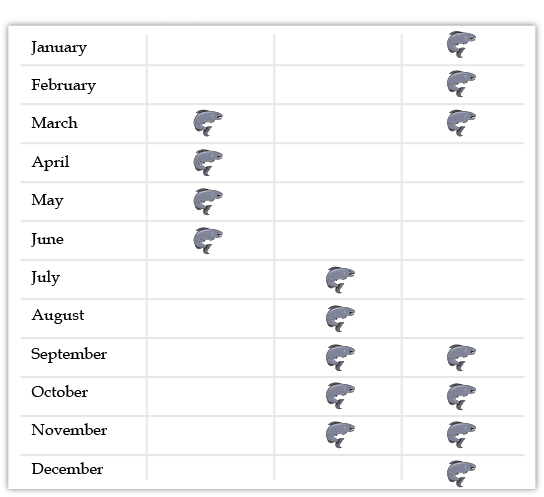 Spring Chinook are considered the best eating salmon on the planet. Limits are not normal but the quality is over the top. We will use different baits an tackle for Spring Chinook or Winter Steelhead, with lighter gear for Steelhead usually 10# to 15# line. Spring Chinook will demand heavier gear with #25 to 30# line. We choose to anchor in migration paths outside the heavy river flow as the river can be 8,000 cfs to over 10,000 cfs. This is quite different from the Summer and fall river flows of just 2,500 cfs to 1,600 cfs. The river flow dictates our fishing methods. The Summer and Fall months we are found trolling the Rogue River estuary where large bright King Salmon flush in and out of the ocean on the tides. We have the top off to allow maneuverability and vision while we troll up and down the scenic Rogue River Bay. This is a most productive time of year for harvest of great eating fresh King Salmon. Want to fill your freezer Bottom Fishing the Rogue Reef might be your choice. Everyone catches fish of all colors and sizes, all of which are great eating and tons of fun to catch! The ocean conditions dictate when our ocean charter trip can take place. Call for latest updates on ocean conditions.